Reserved until May 9 ? 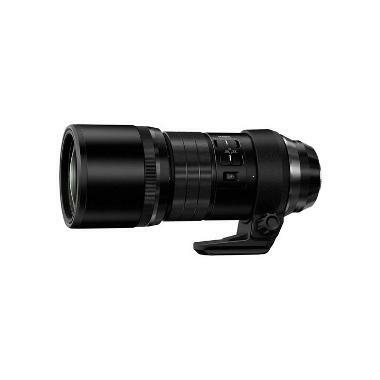 The Olympus M.Zuiko 300mm f/4 IS PRO Micro Four Thirds Lens provides a lot of length for shooters of the Micro Four Thirds system in as portable a frame as possible. On the 2x crop of the Micro Four Thirds sensor, you get an astounding 600mm reach with this lens. It is designed specifically for fast subject matters. There are 17 seals on this lens to protect against dust and water and it can handle cold temperatures down to 14°F. To shoot manually, you must pull the focus ring towards you. Some shooters find this to be more intuitive and quicker than feeling for a small switch on the barrel. An L-Fn button can be programmed with one of up to 27 different functions in addition to the lens' Focus Limit abilities. Three HR and one E-HR element ensures a compact size while correcting for curvature and spherical aberrations. This lens is also compatible with the OM-D series' Silent Shutter so that you can photograph wildlife discreetly. When paired with certain Olympus OM-D cameras, you can use both lens stabilization and camera stabilization for a total of 6 stops of shake compensation. This lens is ideal for safaris, sports, and wildlife.